The City Leaders Program team recently got an exciting new addition to the family– an amazing, high school intern, Latisha. She will be joining us for the rest of the year until her graduation from high school in May. 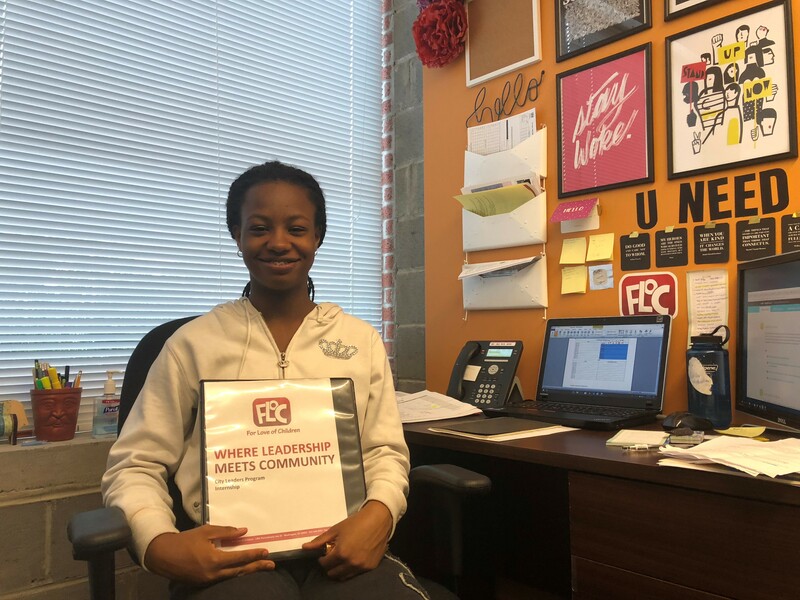 We are excited to welcome Latisha to the team and are even more delighted that she will be featured on the blog about her experience working here at FLOC and her high school experience. Please enjoy the following excerpt from her first week as an intern with the City Leaders Program team. Hi there, my name is Latisha. I’m in my last of year of four LOOONG years (AKA, high School of course) and I go to Parkmont School, which is somewhere in DC. In my free time, I like to go out with my family because it’s pretty good to spend time with family no matter where. I spend the rest of my time trying to complete homework and at the end, once I am done, I fall asleep and wake up to a new day (just really early in the morning). Since I started 12th grade, I decided it would be pretty good idea if I started an internship. An internship gives me an opportunity to try something new and different. I didn’t just want an internship where I had to grab coffee, I wanted something to stimulate me. My school advisor thought so too so she recommended me to some places. Finally, after she helped me, I was able to secure an internship with For Love Of Children. I was beyond excited. I couldn’t wait to find new ways to support their mission. I heard of the organization way before I even started interning here, mainly because a number of my classmates participated in the Neighborhood Tutoring Program and my good friend, Alexis, previously interned here. I’m hoping, as I spend my time here, that I will improve my communication skills and be more confident. I want to do this because as I was growing up, I had an opinion about everything! However, I began to believe that my opinion didn’t matter and that It didn’t make sense to share it. I know that the next time I write, I will be able to talk about how confident I have become as a result of my internship with FLOC.